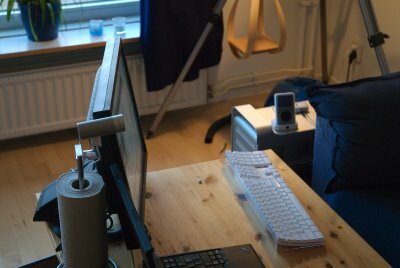 This post started out as an observation about the weather, but then I realized that I should write a few words about my return to Sweden first. I returned to Stockholm yesterday, after five weeks in Texas. I had a wonderful time with my family and friends and because the vacation was so long, I was actually able to relax a bit too, rather than feeling I had to run around every day to fit in as much as possible during my stay. The flight back to Stockholm was a bit interesting. My flight to Newark was delayed a couple of hours due to congestion in the New York area. According to the plane's pilot, the whole area from Washington up to Boston is usually too crowded for the number of flights scheduled, and so delays are common. Unfortunately, I had only one hour between flights in Newark, so I missed the flight to Stockholm. I wasn't the only one going to Stockholm from Austin. There was one other person with the same itinerary. When we learned that we were in the same predicament, we began to chat a bit. Her name was Delta, and she was visiting Stockholm on business. While on the ground in Austin, we learned that it wouldn't be possible to make our connecting flight to Stockholm, so on the advice from the flight attendant & gate agent, we rebooked through Amsterdam. When we arrived in Newark, Delta and I hitched a ride on one of the electric cars so that we could get to the other gate as quickly as possible. We arrived just a couple of minutes after they had closed the doors of the plane, so we missed the flight to Amsterdam too. We went over to the customer service desk and rebooked our flight for a second time. Amazingly, we managed to get a connection through Oslo. It was only a few minutes afterward that we boarded the flight. The flight from Newark to Oslo was less than 7 hours long, so it went quickly. We watched the film Lady in the Water on the flight. It was interesting, but I cannot recommend it. In Oslo, we mistakenly walked out through Norwegian immigration and customs, so we ended up having to go back through the security checkpoint again. Once inside the international area of the terminal building, I bought a few bottles of alcohol. Because Norway lies outside the European Union, there are no taxes on alcohol for folks travelling outside of Norway. A lot of alcohol is sold at that airport, I can tell you. Norwegian alcohol taxes (the taxes ordinary Norwegians pay) are some of the highest in the world. The flight to Stockholm was very quick — like flying from Austin to Dallas. When all of the baggage had arrived on the conveyor belt, neither my bags nor Delta's were there; so we both filed claims with the helpful chap at the Servisair desk. I said goodbye to Delta and caught the bus into the city. Once at home, I had a shower, unpacked my carry-ons, and had a hot bowl of soup for lunch. Two of my three checked bags arrived at seven in the evening: my suitcase and my computer. I'm glad to report that the computer survived the trip without any trouble, and I'm typing this post on it right now. My mom gave me her old iSight camera as a birthday gift, and I have it connected to my Mac. I'm looking forward to using for video chats with friends and family. 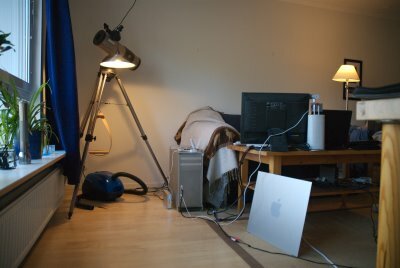 I had a bit of a disturbing experience when I first walked into my flat: the place smelled awful. At first I thought it might have been some food that had gone bad, but then I localized the smell to the bathroom. It turns out that the water in at least one of the vapor traps had evaporated. There are vapor traps in the toilet, the floor drain, and the washer drain pipe. I put water in each of them and opened the windows to air the place out for a bit. Later in the evening I joined Daniel and Jenny for a quick trip to the IBM office where I helped D. install the memory I bought him for his lovely little Mac mini. I stayed up late last night: partly this was due to jet-lag, but partly to watch the planned space shuttle launch. The launch was scrubbed due to thick clouds over KSC. This morning was cloudy, but the skies cleared off around noon. 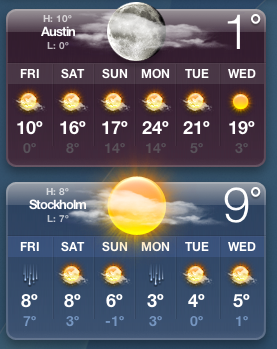 I was not too surprised to see that it's colder in Austin than it is here in Stockholm. This is partly due to the fact that it's nighttime in Austin; but even considering this, it's strange. This past December has had very few freezing days or nights here in Stockholm. The weather is strange sometimes. 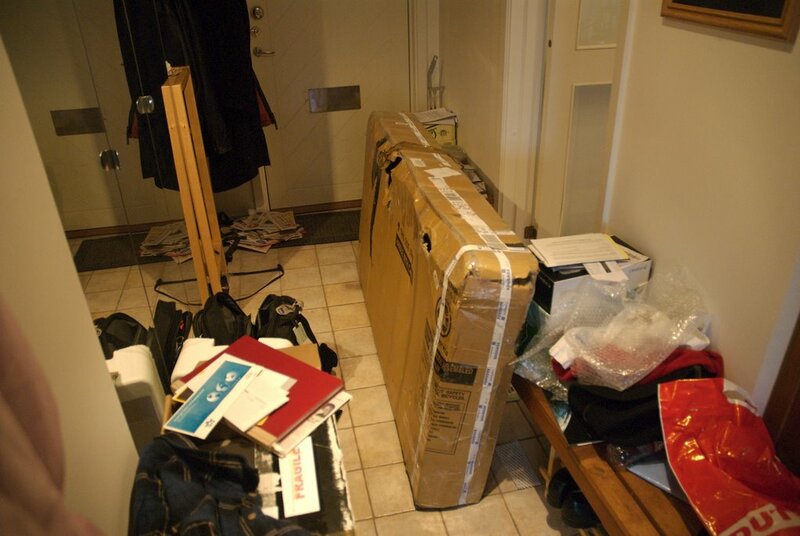 A few minutes ago my third and final piece of checked luggage — my bike! — arrived at my doorstep. I had packed a bunch of other stuff in with the bike to make the most of the fifty pound weight allowance. It seems the bike had a bit of a rough ride. 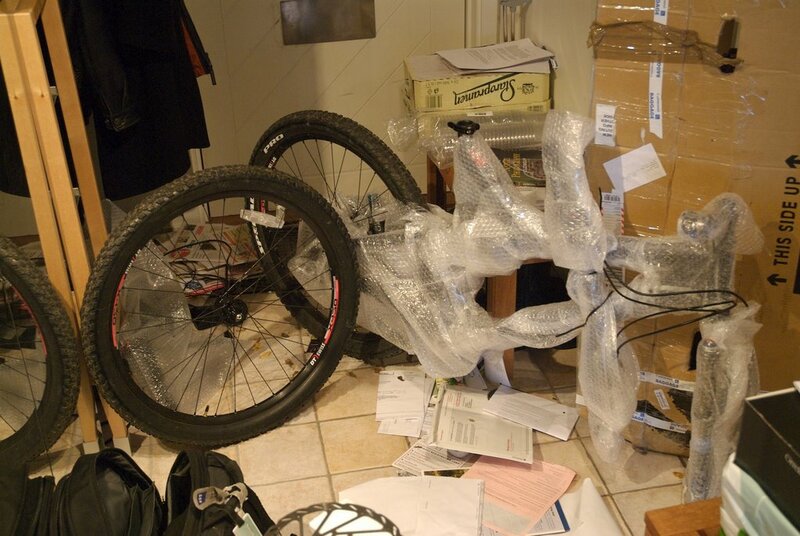 Labels on the box indicate that the bike arrived here via Amsterdam. And oddly enough, a bottle of Tabasco sauce was missing from the box. I packed two in there, and only one arrived. I hope some Dutch airport freight handler is enjoying it right now. I'll have to see if all the nuts and bolts arrived too. I hope so, because I'm hoping to take the bike for a spin tomorrow or Sunday. Although it's a bit muddy and wet out, there's no ice or snow on the ground, so if I manage to put the bike together, it should be decent riding. Tonight I plan to go climbing at Klättercentret. I never managed to get in a climb while in Austin, so I look forward to tonight's session. My right wrist had been giving me a bit of pain about a month ago when I went to Austin, and now it's fine. So perhaps the time off from climbing was a good thing. All is well in lovely Stockholm. Now I'm going to the ICA to get some groceries and to restock the fridge. It's nice to hear that you arrived safe home and all your things finnaly got their destination as well. I'm also in Stockholm, but I'm leaving today. I was here for a week for business, interviewing peopleo for my PhD about Digital Television. I rented an apartment in Kungsholmen, in Flemingsgatan. It was very nice. In my blog you'll find good panoramic pictures of the city. I got a 9 shot panoramic from Slussen. they'll be online tomorrow. I'm glad you made it back even if your tabasco didn't make it with you.